This book has been on my shopping list for a long time. Each time I wanted to buy it, I hesitated because of the price. The 226-page paperback edition is selling for $95 on the Anatomy For Sculptors website and Amazon. Then out of the blue, I was offered a review copy by co-author Sandis Kondrats. That's great because I can now tell you what's inside the book. The concept of this book came from the other co-author Uldis Zarins, a classically trained sculptor. While he's learning sculpting, he was frustrated by the lack of anatomy books for sculptors, and so he decided to create such a book. The book was crowd-funded successfully on Kickstarter in May 2013. So now the book is out. 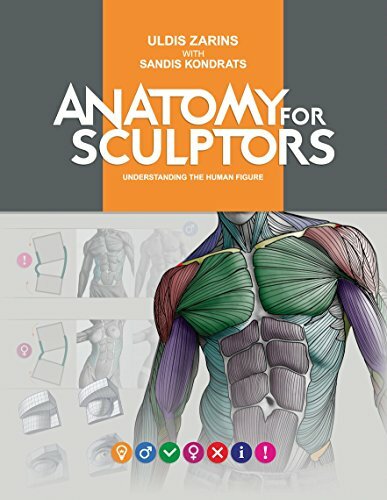 Anatomy for Sculptors is available in paperback, hardcover and PDF. On Amazon, there's also the Kindle edition but the book's split and sold as separate titles namely for Figure & Torso, Head and Neck, Upper Limb and Lower Limb. I don't have the Kindle edition but from the preview pages available on Amazon, the layout is similar to the physical book, which means the text are going to be too small on a 6-inch Kindle. The book is in full colour so you don't want to read it on any black-&-white Kindles either. This is a fantastic anatomy reference book, not just for sculptors. There are lots of wonderful pictures included such as photos of live models with muscle diagrams overlaid, 3D scans, skeletons and schematic drawings. And of course there are diagrams of proportions for bodies and head sizes. The coverage is comprehensive, from head to toe. Photos of the live models are particularly useful. They are usually shot from various angles. Then the photos are overlaid with simple schematic drawings showing the muscle groups, and then it's further overlaid with more detailed muscle fibre drawings. All these are in full colour and with the multiple angles and overlays, you can really get a good idea of the form and structure of the muscles. The main difference between this book versus other anatomy books is the inclusion of the various body postures. In addition to the usual standing figures, there are many examples of stretched muscles that come from different body postures such as twisting torso, arms moving from the top, front of chest, side, and to the back, behind the head and hand on shoulder. This is helpful because you don't have to second guess how any muscle will look like when in stretched mode or moving into different positions. Other anatomy books mostly show just the front, sides and back of the body and limbs, with the muscles in relaxed state. Most pictures in the book are self explanatory. The text are mostly labels, captions and tips on things to take note of. The few pages on facial expressions would be more helpful with explanations though. Anyway for facial expression, check out The Artist's Complete Guide to Facial Expression. Overall, this can be considered an indispensable anatomy reference book for artists and sculptors. It's certainly an expensive book. Whether it's worth it depends on you. You may complain about the price, but I doubt you will complain about the quality. To save some money, you might want to get the PDF version which is about half the price of the paperback. As to why the book is so pricey, Kondrats said that it's because they had to purchase licensed anatomical photographs, hire a photographer, models, editor and graphic designer. And all that took them 5 years to produce the book. Coming up with a book like this is not easy, and the amount of effort they put in is evident in the production quality and end product.